MUNICH – Last June, the European Commission announced its about-face on bank restructuring. The money for recapitalizing distressed banks would now come primarily from creditors, not European taxpayers, with a pecking order to specify which lenders would be repaid first. All of this is welcome, at least in principle. In practice, however, the scheme leaves much to be desired. The problem is that a very long list of exceptions reduces the recoverable assets to such an extent that in many cases it will still be impossible to make do without public money. The long-term plan is that this money should come from a fund created by European banks themselves. But the Eurogroup (a meeting of eurozone finance ministers attended by the European Union’s economic and monetary affairs commissioner and the European Central Bank president) is suggesting that, until then, the European Stability Mechanism (ESM) – and thus the taxpayers – will fill the gap. Given that taxpayers are thus supposed to finance guarantees for deposits up to €100,000 ($133,000) – the median level of Dutch household wealth and twice the German median – the Eurogroup’s proposal boils down to a massive redistribution of wealth in Europe, the dimensions of which are not understood by the public. The idea of exempting banks’ secured debt from the pecking order for repayment is extremely problematic as well. While this proposal may sound harmless and almost self-evident, it is not; secured debt needs no further protection, because it is already secured. Viewed from this perspective, the additional protection afforded by the exemption is highly surprising. The exemption for secured debt undoubtedly concerns mainly the refinancing loans that the ECB has extended to commercial banks against increasingly weak collateral. For the eurozone’s crisis-ridden economies (Cyprus, Greece, Ireland, Italy, Portugal, and Spain), the combined total is €732 billion. These loans extend far beyond providing the liquidity that these countries need for internal circulation, for which a maximum of €335 billion – their available stock of central-bank money – would have sufficed. Instead, by weakening safety standards, bailing out foreign investors, and financing current-account deficits, the ECB has undercut and replaced the private European interbank market. With several banks in the crisis countries on the verge of bankruptcy, many of these loans have now turned toxic. After all, if one takes the average of estimates reported by reputable sources, the write-off losses of the six crisis countries’ banks amount to about €670 billion. Participating in these write-offs would put huge strain on the Eurosystem (the ECB and the central banks of the eurozone member states), which has only around €500 billion in equity capital. The riskiness of the ECB’s strategy of using the printing press to bail out banks, including their public and private clients, would become apparent to everyone. Thus, it is clear how the losses incurred by the ECB’s de facto regional fiscal policy are to be avoided: the write-off costs will be transferred from the ECB to the ESM. This makes no difference to taxpayers, who will have to pay for both institutions’ losses in the same manner. But it has the advantage of allowing the ECB to present itself as having a clean balance sheet, thereby enabling it to maintain its current policy. Ultimately, this is merely a new round of the eurozone’s old game of financial hide-and-seek, whereby losses are obscured by distributing them among different institutions and time horizons. The game started with the bailout fund for Greece, which was followed by the European Financial Stability Facility, the European Financial Stability Mechanism, and the International Monetary Fund, which in turn were relieved by the ESM. In each case, a major objective was to reduce the burden on the ECB, which had advanced the money by printing it and would have run into serious difficulties without help. The entire arrangement is highly problematic from the standpoint of democracy, because the initial decisions about undercutting the capital markets by means of public credit were taken by the ECB’s Governing Council, in which large countries like France or Germany have the same voting power as Cyprus or Malta. Indeed, the national central banks’ allocation of emergency liquidity assistance required approval by only one-third of the Governing Council’s members, and the six crisis countries had these votes. According to the Eurogroup’s proposal, these self-awarded loans, too, are now to be secured by ESM funds. While the European Union’s national parliaments must still decide on the scheme, they essentially have no option but to assent, because to do otherwise would severely harm the ECB. When they finally get to vote on the matter – years after the ECB’s risky credit maneuvers – they will have no choice but to bail out the ECB, the true hegemon of the eurozone. Hans-Werner Sinn, Professor of Economics at the University of Munich, is President of the Ifo Institute for Economic Research and serves on the German economy ministry’s Advisory Council. He is the author of Can Germany be Saved? In baseball, they call it coming “from left field”. President Barack Obama’s decision on Saturday to seek Congress’s approval for strikes on Syria ranks as the least expected moment of his presidency – and probably his riskiest. His immediate fortunes are now in the hands of two very unfriendly entities: the Assad regime in Syria and the Republican Party on Capitol Hill. Both have been handed their leverage. Neither can be relied upon to use it predictably. There can be little doubt that Mr Obama is entering the most dangerous phase of his presidency, to some degree voluntarily. First, the positive side. Mr Obama’s request, which Congress will only debate in the week beginning September 9, has bought him time to push for a diplomatic solution. On Tuesday Mr Obama travels to Petersburg for the G20 conference. Last month he turned down an invitation by Vladimir Putin to hold a bilateral meeting in Moscow after the summit. By postponing the Syria strikes for at least 10 days, Mr Obama has a window to talk to Mr Putin, the Chinese, the Arab League and other key actors. Hopefully he can prove that diplomacy works with the threat of action. That would be a triumph. But it would be optimistic to suppose Mr Putin and the like will take Mr Obama’s threat of missile strikes seriously before Congress has authorised them. Until then, Mr Obama cannot afford to spend too much time out of Washington. Nor can his principals, John Kerry and Chuck Hagel, secretaries of state and defence, both of whom will need to testify to Congress. To be sure, Mr Obama is betting he will get the green light from both houses, as George W. Bush did for the 2002 bill authorising the Iraq war, and as George H.W. Bush did – though by a far narrower Senate majority – for the first Iraq war in 1990. No president has been turned down since the War Powers Act passed in 1973 – though few have bothered to ask. Should Mr Obama get his authorisation next week, or the week after, he will emerge stronger both at home and abroad. At home, he will have acquired co-ownership with Congress of whatever subsequently happens in Syria. At a moment when large majorities of Americans are sceptical of any military action against Syria, Mr Obama’s instinct is to make it bipartisan. And abroad, it will strengthen his credibility too. A yes vote would demonstrate US exceptionalism at its best – burying its political differences to respond to the barbaric gassing of hundreds of innocent foreign children. That is the plan. But after the UK parliament’s no vote last week, it is hard to feel confident that it will go to script. The mathematics in both the Democratic and Republican parties are too fluid to forecast a clear majority, even though that must still be the probability. There will be plenty of Republican hawks, such as John McCain, and reliable Democratic centrists, such as Max Baucus, in favour of the bill. They will be joined by some liberal hawks, such as Nancy Pelosi, Democratic House leader. But isolationist Tea Party Republicans have teamed up with Democratic liberals in the past to defeat legislation. It is not inconceivable they will do so again. A defeat would be disastrous for Mr Obama, who would then have to choose between flouting the will of Congress or becoming a lame duck on the global stage. We must assume the White House is able to count votes better than David Cameron. The alternative is too dire. Either way, Washington is about to be consumed by a debate about America’s role in the world and the future of Mr Obama’s presidency. Assuming Mr Obama is less incompetent that Mr Cameron, by far his biggest hurdle will come on the ground afterwards in the Middle East. Colin Powell once said of Iraq, “you broke it, you own it”. If Mr Obama gets the approval he wants, then from that moment on the US will own what happens in Syria. This is Mr Obama’s real gamble. Could he be subconsciously hoping that Congress votes no, as some have somewhat wildly suggested? Or has the UK vote, among other twists, made him far less reluctant on Syria than he was? Whatever is bolstering Mr Obama’s resolve for war, that is the course he is asking America to approve. Last Friday, Mr McCain spoke for many when he dismissed the UK parliament’s vote as a “symbol of Britain’s withdrawal as a power”. That may well be right, although the last time the UK stood aside from a US war was in Vietnam – a quagmire that helped sink two presidencies and haunted most of their successors. It was arguably the costliest military blunder in US history. Mr Obama can count upon the backing of many McCains in the coming days. There is a still a strong establishment consensus – probably a clear majority – for the US to play the world’s policeman. But much as Lyndon Johnson hoped escalation in Vietnam would help him get out quicker, Mr Obama risks getting into a game of poker that he cannot control. He would of course be doing so in tandem with Congress. And it would be with the best of intentions. But that is no insurance against the unexpected. For better or worse, Mr Obama is gambling his presidency on Syria. In the past month, silver and gold prices have been performing very well relative to how they performed for the most part of the year. This is great news for all the precious metals investors who held onto their investments even as metal prices went into freefall since January. Reasons for the bounce back in precious metals' pricing include a recent weakening of the Indian currency, strong physical demand for jewelry, coins, and bars globally, and the continuation of "cheap money" policies in the U.S. due to growing economic and geopolitical uncertainty. Since the official publication date of my article, silver prices have increased by approximately $5.25 or 28%, and gold prices have rallied by approximately $195 or 16%. Despite positive news coming from the metals sector recently, bullion prices still have ways to go before my predictions come to fruition. 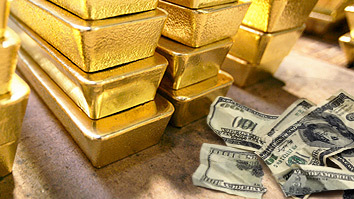 Throughout most of the summer, talk about the possibility of the Federal Reserve slowing stimulus or 'tapering' sent precious metals' prices into an extremely volatile state, with the general trend being downwards. But talk is really all it is. Seeing how debt will continue to increase and how central banks will continue their monetization not only in the U.S. but on a worldwide scale, I see very little possibility of tapering which leads me to assume that metal prices will trend higher. 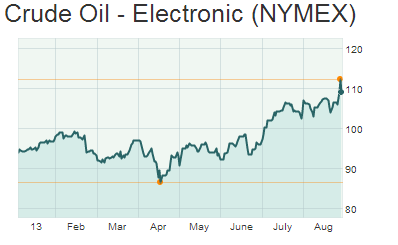 Year to date, NYMEX crude oil prices have risen approximately 13% and have not fallen below $86 a barrel. Since the alleged chemical weapons attack on August 21, geopolitical risk from the Middle East is once again a huge issue leading to oil prices rising about 5.5%. And since gold and oil are often correlated especially in periods of sharp increases in oil prices, the event sent gold prices about 3.9% higher. I don't think the full effects of this event is priced into gold and silver prices since the geopolitical risks emanating from the Middle East has been underestimated for quite some time. Another positive factor for the gold market is the very delicate situation regarding peak gold and supply from South Africa. Beginning as early as next Tuesday, gold miners in South Africa will go on strike in demand for up to a 60% increase in wages. South Africa's biggest gold miners - AngloGold Ashanti, Gold Fields, Harmony Gold and Sibanye - as well as several smaller operators, have been served with a formal strike notice, the chamber of mines said. The union leading the strikes-National Union of Mineworkers-represents about 64% of South Africa's 120,000 gold miners. Workers in the automotive, construction and aviation industries are already on strike to demand pay increases in excess of the considerable inflation rate of 6.3% in July. I chose to leave out these points because they have already been discussed in varying forms of detail on my previous articles. One last note I should point out is that despite the recent gains, gold remains down 16% this year which is leading to contrarian buyers buying gold at what they see as discount prices. Overall, I believe we are back into that track where gold is the hard currency of choice, and I expect for this trend to accelerate going forward. German Finance Minister Wolfgang Schäuble has raised the possibility of a third bailout for Greece. Now many are calling for leaders to lay out all they know about the euro crisis. But total transparency carries serious risks. In a time when people wrote in autograph books and not on Facebook walls, one sentence from the 18th- and 19th-century German poet Matthias Claudius became immortalized: "Say not all that you know, but know all that you say." That would be a good lesson for those politicians who are handling the euro crisis. Absolute honesty, which many are now demanding of the German government after its most recent comments on Greece, is simply not wise. Of course politicians should not lie or twist the facts. German Finance Minister Wolfgang Schäuble has been guilty of the latter over the last week. First he stated publicly what many have long accepted as obvious -- that Greece will need a third bailout package. Amid the ensuing uproar, Schäuble defended himself with the following words: "The German government states what it knows at each point in time." Such words are not credible. Schäuble certainly didn't suddenly become aware yesterday that Greece needs more money, yet he's only talking about it now. In the European Union, such small-step approaches to problem solving are unavoidable. The euro crisis has bound Europe together in a common fate -- the Germans, Finns and Dutch putting billions of euros on the line for Greeks, Portuguese and Irish. Yet political institutions in the EU and euro zone remain weak. That's why in the past, virtually all member states, from southern Europe through to Germany and France, flagrantly disregarded the bloc's rules on sovereign debt limits. They knew there was no reason to fear sanctions when they spent beyond their means. The rules have since been strengthened. But the EU still has no real government, its parliament has severely limited powers and real policy-making occurs almost exclusively on the national level. It's under these constraints that the EU approaches the euro crisis through negotiations between member states. And a fundamental principle of these negotiations is that not all cards are laid on the table at once. It's a classic way in diplomacy of avoiding bursts of outrage. Especially problematic is the fact that negotiations don't occur among EU policymakers alone. Rather, the maneuvering increasingly resembles what political scientist Robert Putnam describes in his two-level game theory: Politicians have to sell their policy goals both at home and abroad. And all too often, one side is pitted against the other -- as when the Greek prime minister says he personally opposes draconian budget cuts, but that his EU partners give him no choice but to accept them. This game of contortionism will never win the prize for most graceful politicking. Yet in today's European Union it is often the only way to push through legitimate demands. A prime example is the list of conditions imposed on Greece in exchange for emergency loans. Despite all justified criticism of the specifics of those conditions, the fact that Greece needs reform is just as evident as the fact that Greek domestic politics is incapable of making that reform happen. Only under pressure from abroad did change ultimately come. This pressure occurs only when aid is given out piece by piece. Why should Greek politicians adhere to fiscal discipline or implement reform when they know they can count on unlimited credit from abroad? The threat of stopping payments is the only weapon the so-called troika of lenders has when it makes its repeated visits to Athens. And the political contortionism works both ways: Schäuble himself doesn't have to ask for billions of euros at home in Germany when he can simply point to the findings of the troika. In the end, the haggling over releasing loan payments is frustrating for both sides. It brings only a very slow pace of change to a political system that even most Greeks regard as broken. Bearing all this in mind, it would make sense for German politicians not to make public all their thoughts on the euro crisis at once. Yet voters expect not to be lied to. The only way through this conundrum is for politicians, when in doubt, to admit that they cannot answer certain questions while the crisis continues. However, they can make clear the direction in which they are headed: Long before Wolfgang Schäuble raised the possibility of a third bailout for Greece, Social Democrat Peer Steinbrück told SPIEGEL in September 2011: "Of course the Germans have to pay." Who would have guessed back then that the current candidate for chancellor would be considering not just loaning, but actually giving money to Greece -- something that is increasingly part of the discussion? In the long run, there's one thing that will help Europe through its crisis management: a stronger European Union -- in the form of truly binding rules, perhaps even a European finance minister who could directly intervene in national budgets and put an end to the cumbersome quibbling among member states. Schäuble himself has raised the idea of such a master minister. Perhaps out of frustration with the endless diplomatic game playing.